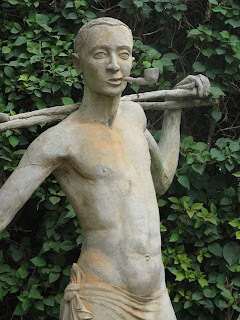 I saw this statue of a traditional cow herder in Mbarara Uganda and I thought his pipe was fantastic. I haven't seen anyone smoking a pipe here but I assume that everyone used to back in the day. I'm in Kabale, and about 40 km for the Rwanda border. It's a decent size town. 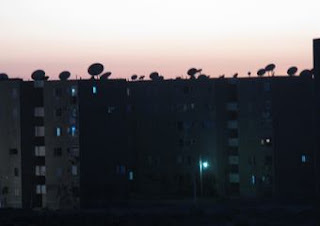 The kind of town where they have internet cafes, for example. I'll spend a day here and then cross over. But what I most wanted to say was that I saw some flame lilies yesterday and it filled me with so much joy. 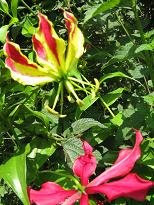 When I was a young boarding school student, the flame lilies used to bloom right before Christmas vacation. The older kids would take an afternoon and collect buckets and buckets of them to decorate before the parents arrived. I remember one time a group of us had to testify at the court in Mwinilunga. The case was about a guy who stole a bunch of things from the school including my towel and my Hawaiian shirt. That's not important for this story. On the drive back to school, we passed through an area with lots of flame lilies. The deal was the car would go pretty slow so we could stand on the rear bumper and if we saw one, we'd jump off, grab it, run and cling on again. I had never jumped off a moving car before and didn't hit the ground running. It wasn't like I fell over, it was more like I stayed standing up but the ground came up and smacked me in the face. Ha ha. You get better with practice. I still remember that day as one of the best ever. In Egypt you have to wear long pants so when I started cycling from Addis Abeba it felt great to wear shorts for a change. 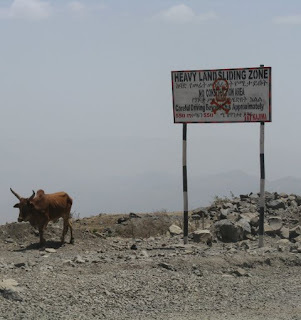 I envisioned a leisurely trip of 40km to Muketuri. I started out late and went for an hour in the wrong direction. 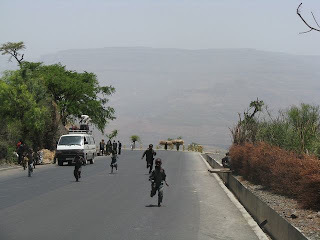 Also it turns out that Ethiopia is quite hilly. At around 2pm I had traveled 40km but everyone still insisted that Muketuri was 40km further. Fun Fact: Ethiopians say everything is 40km away. By this point I was sunburned and had to put on my long pants again. In the end, I crashed at a town called Bunar which was 10km short of Muketuri. I was too sunburned to cycle the next day. I expected the skin to peal off but instead my legs developed these tiny blisters so when I rubbed my knee they would burst and make my hand all icky. Egypt has a lot problems. The economy has not kept pace with the exploding population. Freedom of religion and the press are restricted. The president's main political opponent got chucked in jail. People worry that the violence which happened ten years ago will come back. There is a lot of uncertainty about the future. 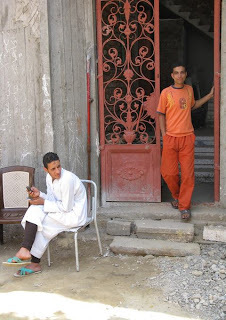 But I had beautiful time in Egypt and since this is my last blog entry about Egypt, I wanted to write something upbeat. I stayed at Al-Minya for a week on my way out Egypt visiting some friends. The police in Minya are more relaxed. The vendors are scrupulously honest. The city clean and prosperous. Everywhere beautiful new buildings are being constructed. The whole place is overrun with university students brimful of enthusiasm. At one of the villages near Minya an Arabic teacher asked me to give this message to my friends in America. "I'm a teacher and I have Muslim students and I have Christian students but I love them all." That's the Egypt I wish everyone could see. I spent a month and a half in Aswan waiting for the Sudan visa that never came through. I was at such a wonderful 1920's hotel. I had corner room on the top floor with a balcony on both sides. The shared bathroom was one of the cleanest I had in Egypt. And at $2.75 per day, it was my cheapest Egyptian hotel. I generally started moving around at 1 pm. I hung out with Mohamed and Sheik Hassan who had stalls next to the hotel. We used to have a deal, Mohamed bought falafel for me at Egyptian prices and I watched the stall for him when he went to the mosque for prayers. Assad and Mohamed Said got off work from the fertilizer factory at 7 pm. Assad had a second job as a barber. 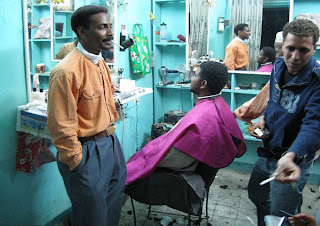 I spent most of my evenings at his barber shop making tea and chatting to people waiting to get their hair cut. Sometimes I wandered over playstation place next door or to Mohamed's restaurant on the other side. The kofta there was fantastic. Also the salad. Normally I'm not very enthusiastic about salad but his was really exceptional. 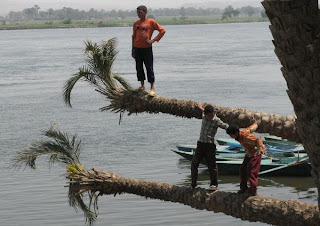 Some days I hung out with Mustafa the Journalist at the "round club" next to the Nile. The waiter's name was also Mustafa and the same for the man at the door. That made remembering easier. We'd drink tea and watch the sailboats. They were building the first McDonalds in Aswan downstairs. Then maybe we'd go back to Mustafa's house to eat supper. Other days I tagged along with Wael the micro bus driver and chauffeur. I had dinner with his bosses a couple times. I spent a lot of time in an area called Sel. It was where you had to switch micro-buses when you went to Assad's house. I drank tea at Sheik Sabre's tea shop there. Wahed shai kamsina. One tea, half size. Sheik Sabre wouldn't accept any money from me. I drank so much tea in Aswan that at one point I got a scrape on my arm but instead of blood only tea came out. Ahmed the Nubian worked at shop next door selling ring tones and MP3's for mobile phones. He hooked me up with a library of Nubian music on my flash drive. I sat around talking with Abu Abdulah and his apprentice plumbers. He gave me an antique Egyptian coin from his collection. It's from 1938 and it's the only Egyptian souvenir I plan to keep. When I was feeling wealthy I ate chef Memnon's macarona. I generally paid the tourist price even though I was the only tourist ever in history to eat there. Two other tourists walked by once but didn't stop. Salaa's father owned restaurant. I lost game after game of dominoes to Salaa and bought him cokes. If I was broke they let me pay Egyptian price for macarona and tea was free. But my favorite times were at Assad's just shooting the breeze with Walid, Bushie, Mahmud, Sheik Goma, Karim, Amir or whoever happened to wander through. Normally Assad closed shop around one in the morning. It was a problem to get a bus that late so Assad would give me a ride on his motorcycle. I'd wear a hat so that the police wouldn't see that I was a tourist and pull us over.